Kayleigh was diagnosed with scoliosis at the age of 9. 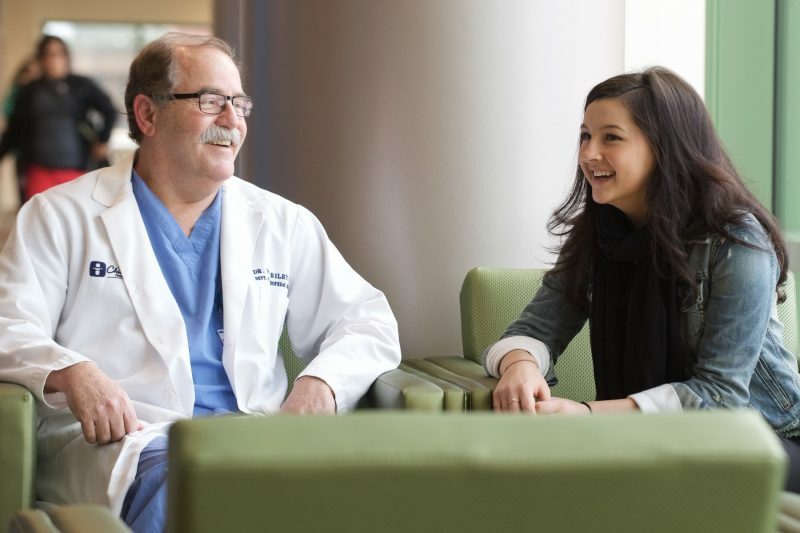 Dr. Patrick Riley, Sr., has cared for her, including spinal fusion surgery in 2016 to prevent her scoliosis from getting worse into adulthood. Kayleigh Hutcheson was known by her family and friends as the “athletic one.” Growing up, she participated in every sport she encountered, from volleyball to golf to cheer, perfecting her athletic prowess along the way. By the time she reached high school, she was focused on just one: volleyball. She was an all-around player and excelled as the star hitter for her team. Volleyball was her sanctuary to relieve stress, socialize and pursue her passion. Between school season, junior Olympics season and summer workouts, she always had her feet on the court and a hand on the ball. Sadly, it all came to a crashing halt in December of her junior year at Hoover High School when she was faced with the decision to continue her athletic career or undergo surgery to treat her scoliosis. After surgery, she’d be on the sidelines for 6 months recovering and wouldn’t be able to jump back in where she left off due to fierce competition. Kayleigh was diagnosed with scoliosis at the age of 9. While walking ahead with friends on a family trip to Cedar Point, her mom noticed Kayleigh’s hips and shoulder’s weren’t lined up. When they got home, her mom lined her spine with lipstick and saw firsthand the extent of its curve. A friend with scoliosis referred the family to Dr. Patrick Riley, Sr., a pediatric orthopedic surgeon at Akron Children’s Hospital. It wasn’t long after that Kayleigh was sleeping in a night brace to help prevent the curve from worsening. Unfortunately by age 14, her curve had increased from 12 to 36 degrees. It was then Dr. Riley became more aggressive with treatment and put her in a day brace, as well. 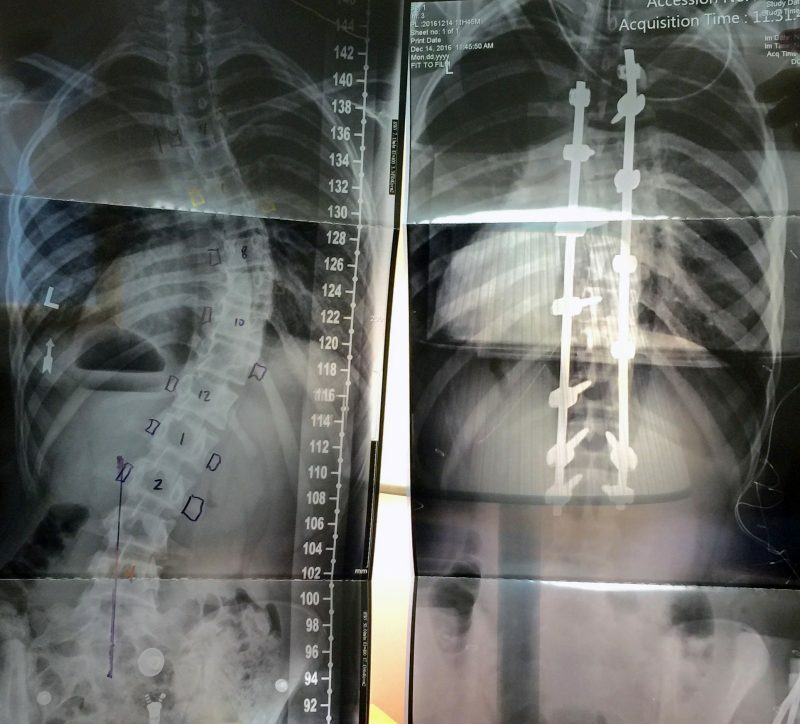 Kayleigh’s curved spine prior to surgery (at left) and straight after surgery. But when her curve reached surgery range at 55 degrees, Kayleigh knew she had to face the spinal fusion surgery to prevent her scoliosis from getting worse into adulthood. Plus, she’d have a chance for a quicker recovery due to her young age. 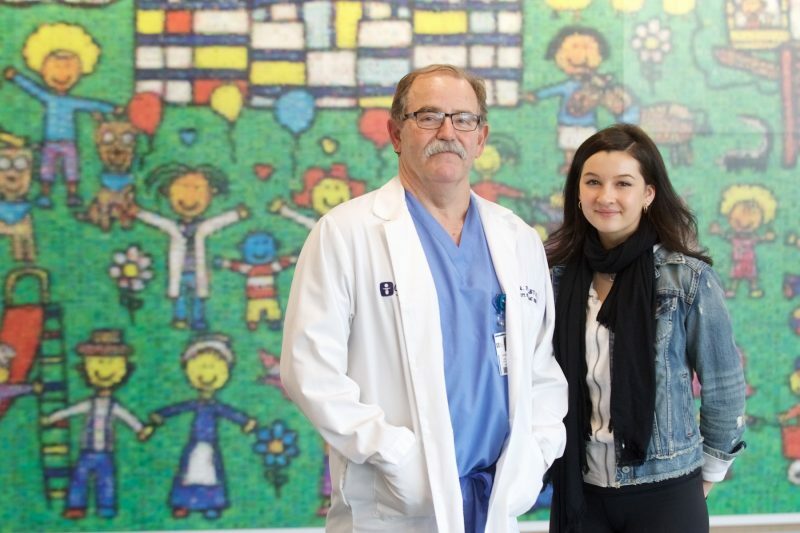 Kayleigh and Dr. Riley catch up recently in the hospital lobby. So on Dec. 14, 2016, Kayleigh underwent spinal fusion surgery. Dr. Riley and his team placed 2 titanium rods on either side of her spine, secured with 16 screws to keep her spine straight. With her spine lined up, they then fused the vertebrae in her upper back. After surgery, she had to take it easy for 6 months. The rods and screws were placeholders — until her spine healed into a solid piece of bone — and she would risk breaking them with rapid movement. After surgery and the 6-month recovery, picking up her athletic career where she left off was unrealistic and Kayleigh began to lose sight of who she was. But just like any other roadblock Kayleigh hit throughout her athletic career, she persevered to the other side and came out stronger than ever. This time was no different. Instead of feeling defeated, she took all those lessons learned and poured them into an interest in the arts. With a sudden abundance of free time, Kayleigh got involved in Hoover High’s Yearbook Club and soon became the North Canton high school’s first student art curator. 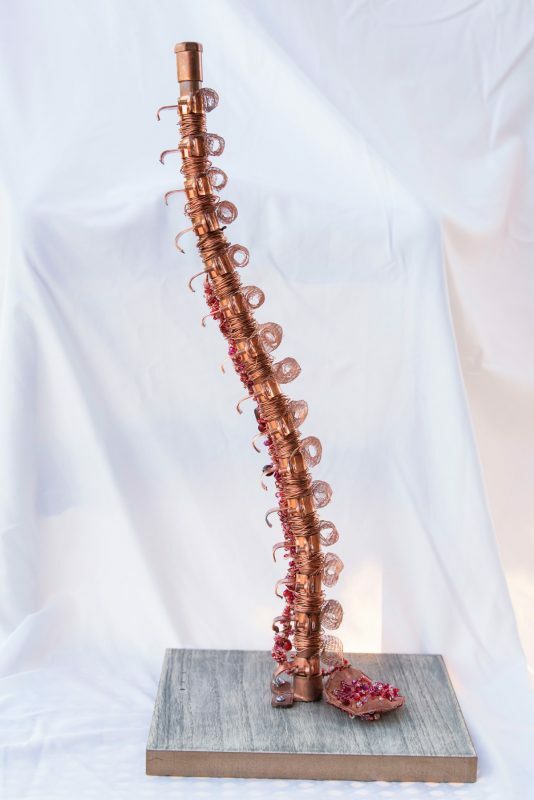 In one of her art classes, she was inspired to create a sculpture representing her spine surgery. Using copper plumbing screws and rods — similar to the ones placed in her own back to keep her spine straight — she constructed a 3-dimensional vertical spine placed atop a wooden block. 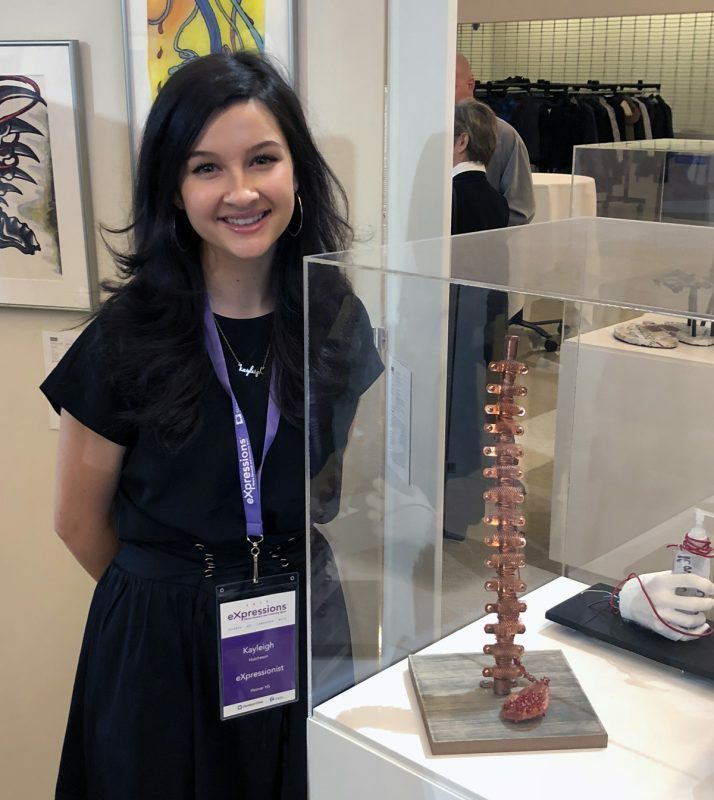 Her sculpture, Spinal Tap, was 1 of 4 art pieces in her class that her teacher submitted to the Cleveland Clinic’s eXpressions™ Art Program, an educational initiative that engages high school students in the creative translation of research studies conducted by Cleveland Clinic summer interns. She received the top Blue Ribbon award for her piece, which was displayed in the hospital’s eXpressions eXhibition.